Which Judge will preside over my Tampa / Hillsborough County Drug Crimes Case? 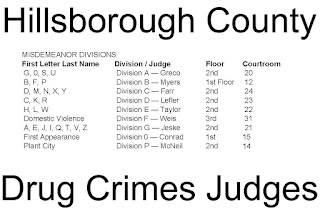 How are Judges in new Drug Crimes cases are assigned in Hillsborough County and Tampa, Florida? Felony and Misdemeanor drug charges are assigned to the various divisions of the court. According to Court rules Misdemeanor Drug Crimes and criminal traffic offenses in which the offense occurred are assigned to a county criminal drug divisions according to the first letter of the defendant's last name. Felony cases are randomly assigned to the circuit Judges. The Drug Crimes rule also states, "When a [Misdemeanor Drug Crimes] notice to appear, criminal report affidavit, or information is filed, the clerk will assign the case according to the following alphabetical distribution." This means that misdemeanor drug cases outside of the Plant City, Florida Division will be assigned according to these charts and pictures seen above and below. Felony cases are all randomly assigned to the Tampa Division. If a defendant is on Probation, the case will be assigned to the Judge that originally heard the case(s). 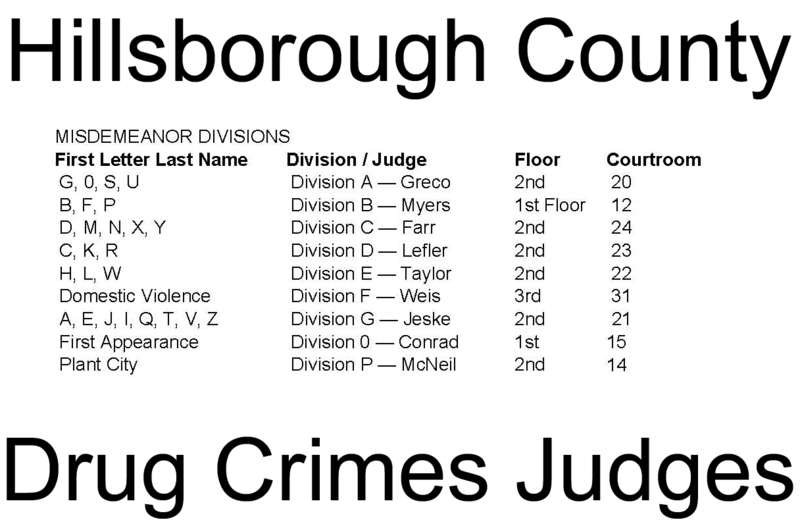 Who Are the Hillsborough County Drug Crimes Judges? Appointed to the bench by Jeb Bush in 2000. Appointed to the bench 2010.